With the support of the Community Council, The Highland Small Communities Housing Trust (HSCHT) carried out a survey for An Camas Mòr to find out what local people would like from homes and what is truly affordable. HSCHT understand that open market homes can be beyond the means of many local people. Therefore HSCHT provide low-cost home ownership models as a way of broadening access to home purchase in the communities they serve. HSCHT do this by protecting the affordability and availability of homes we facilitate, thereby permanently protecting the investment and value for local people. Some of these could be used at An Camas Mòr to ensure homes are not lost to holiday or second homes and are always available to locals to raise their families in the area. For example, a Rural Housing Burden Title ensures that when you move you get your share of the value back. HSCHT then has the first right to buy back the property from you, with the aim of securing another local purchaser. This ensures the home stays in the community and does not become a holiday home! The project is unique in that it has local housing needs as its main core value, rather than building houses purely for profit. The proportion of affordable housing through a variety of means has never been proposed on this scale previously and there is a desire to explore new ownership/ rental options to ensure that housing is made available to people who live and work locally in the long run rather than some of the historical quick wins. 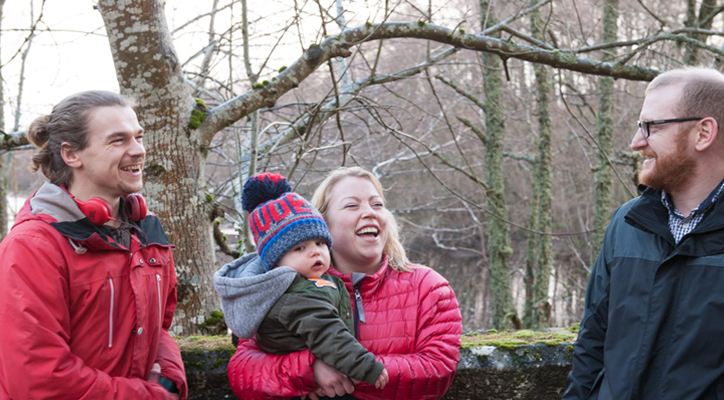 The HSCHT offered myself and my family the opportunity to own an affordable family home in the Cairngorms National Park. We were given a Rural Home Ownership grant which acted as a deposit when purchasing the house. Without the HSCHT we would not have been able to buy our house or have the opportunity to live in such a beautiful forest setting. These houses were sold as homes for life and we have every intention of fulfilling that aim! There is also a clear demand for rental homes and Open Market Sale homes. There is a strong demand for workspaces in or near potential homes. Selling prices for Low-Cost Home Ownership homes between £110,000 and £170,000 could be achieved with Rural Housing Burden equity shares. The Rural Housing Burden is a Title Condition created by the Title Conditions (Scotland) Act 2003 that can be applied by Rural Housing Bodies. It is used widely by HSCHT and other Rural Housing Bodies to protect the affordability of rural homes in perpetuity. The Rural Housing Burden consists of two elements: a) an equity share and b) a right of pre-emption. The equity share protects the discount given to the initial purchaser by suppressing the selling price in the event of a resale. The right of pre-emption means that the Rural Housing Body has the first right to buy back the property when it is offered for sale, with the aim of securing another local purchaser. In setting the equity share, the Rural Housing Body will take account of all relevant factors, including the open market value of the completed home, typical build costs in the area, land value and future value. This normally results in the Rural Housing Body retaining an equity share of 20-40%, and being able to pass that discount onto the purchaser, increasing the likelihood of residents on low-middle incomes being able to afford to purchase it. Rented housing provided by a registered social landlord (RSL) or the local authority. In the case of Highland, this is provided by Registered Social Landlords and Highland Council. Rents are charged at affordable rates and allocations are based on housing need as set out in the Housing (Scotland) Act 2001 and other relevant legislation. Grant funding from the Scottish Government is available to both RSLs and local authorities to build new social housing. Mid-market housing or homes that can be provided to key workers or seasonal workers is a popular housing tenure. They are sometimes referred to as intermediate rents being matched to the local housing allowance rent level (which is the level up to which households can claim housing benefit and it is a recognized Scottish Government limit on affordable rents). This may be of interest to businesses or service providers who struggle to retain key staff. Legislation in this area is changing due to the Private Housing (Tenancies) Act 2016. Any business interested should discuss these changes with HSCHT. There are two strands to the Scottish Government’s Low-cost Initiative for First-time Buyers (LIFT): New Supply Shared Equity (NSSE) and Open Market Shared Equity (OMSE). The NSSE applies to newly built properties by an RSL and the OMSE applies to homes already for sale on the Open Market. NSSE properties would be built by a Registered Social Landlord. Shared equity homes can be provided separately from the LIFT scheme by a community group or developer. Frequently a Rural Housing Burden is attached to the title of the property at the point of sale to protect the discount offered for future sales. This mechanism can be used on developments alongside rented properties to assist with the funding of the project and also to provide a mixed tenure development. Purchasers have to pay for their property through their mortgage and savings contributions thereby providing instant repayment of any development funding required. This could be a viable option to provide mixed tenures. With agreement from the landowner, it may be appropriate to sell part of a development site at the full open market value. In circumstances where infrastructure costs are high, the sale of an open market plot or home could assist with making affordable housing options possible on the site. Open market housing can play an important role in the housing system, in that local house values are dependent on a buoyant market and a turnover of properties. In periods of a decline in open market house values, this can impact on the delivery of low-cost home ownership and other housing models such as Rent to Buy and LIFT. Designing new housing suitable for older people, which includes a wide range of needs including dementia, where level access, flooring, heating & lighting and accessible kitchens are considered at the outset, can save on future resources. Location of properties near facilities is preferred. Houses may be for rent or for sale depending on the funding models available and the household’s circumstances. An Camas Mòr LLP’s plan for the development has sheltered housing on the High Street, in close proximity to retail and leisure facilities. Intergenerational housing is also planned for An Camas Mòr, for example, homes with an annexe that could be used as a granny flat, or a garden flat next to the house. Land: must be in community ownership. Could be secured from own funding or through an application to the Scottish Land Fund. Housing types and tenures: there are a range of options that could be available, e.g. social rent equivalent, mid-market rent, self-build plots etc. The tenure and type of home needs to meet a special need in that community that is not provided for by other strategic housing partners. With a development of the scale of An Camas Mòr, demonstrating this special need could be challenging. Project management: This may be carried out by an agreed partnership with a minute of agreement in place, or undertaken fully by a third party. Construction: A recognized construction rm who are able to provide housing to the required standards should be used following a rigorous tender process to ensure the best value. Due to procurement rules which apply to local authorities and housing associations, a local approach may be more financially viable, along with retaining local employment. Management: In many cases, the community prefers to outsource housing management, such as rent collection/arrears and allocations. However, an option is to retain the maintenance and repair elements in order to provide local employment opportunities and that only the allocation process is outsourced.